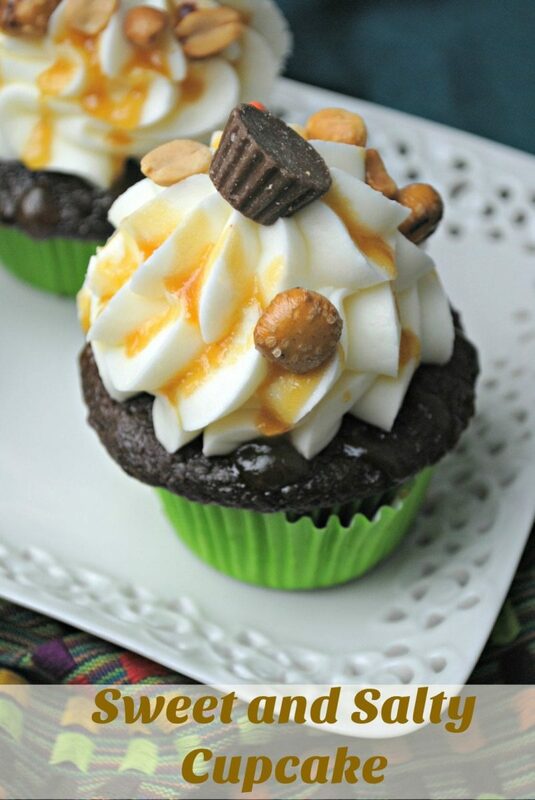 Topped with caramel sauce and Reeses topping mix (if you can find it, simply add small pretzel pieces, M & M’s, and peanuts), this chocolate Sweet and Salty Cupcake is to die for! You are sure to make a good impression with your guests when serving them at a birthday party. Yummy! Beat powder sugar, butter and sea salt in a bowl. Drizzle the caramel sauce and then sprinkle the Reese snack pack. sprinkle some of the remaining sea salt. you had me at sweet & salty!! seriously though it is the best combination. the sea salt butter cream frosting has my mouth watering! It’s definitely a great combination! I also love it! Ooooo la la!!! these sound absolutely divine!! I could go for one right now!! Totally agree! Hoping you will make them Lynda! These do look fantastic but I’m not a fan of sweet and salty I’m afraid. These cupcakes look amazing. I love sweet and salty. Whata super-delicious recipe. I am a big fan of salty and sweet combined treats. OMG printing this as we speak! Delish! I love the sweet and salty combination. These cupcakes sound super delicious! These cupcakes look absolutely yummy (which is the word I use for sweets) I love the toppings that you’ve used. Yum,I can’t wait to make that sea salt butter cream frosting! The sweet and salty combination is fantastic! I can’t wait to try the sea salt butter cream frosting!